Star Trek just a TV show? Perhaps that’s what Gene Roddenberry’s Hollywood and pop culture legacy means to most of us, but to millions of devotees, living as a Super Fan definitely applies. I’m a super fan myself, which led me to even writing professionally for Star Trek: The Next Generation and Deep Space Nine. All the Trek culture introduced me to other passionate Trekkers. This is second in my series of chats with sci-fi loving Super Fans. Ray Lauderback feels that Star Trek characters – especially Kirk and his original crew – act as admirable role models for himself. To me, Star Trek represents the potential greatness of Humanity. The stories are true morality plays. For approximately sixty minutes, we are give hope that Mankind’s innate goodness will triumph, and we will fulfill our rightful destiny. For as long as I can remember, I watched Star Trek TOS and Star Trek: The Animated Series. As a child my Dad’s profession kept him away from home for months at a time, and my Mom worked full time as well. After school, I would stay with my Grandparents, until my Mom came to pick me up. One of my fondest memories is when my Grandfather surprised me with a model of the Enterprise that he secretly built for me as a present! Me and my friends would play Trek as well, like kids used to play Cowboys and Indians. I can remember being so excited when TNG came out! Finally, we got a NEW series! What makes you a Superfan? Is there a unique criteria? 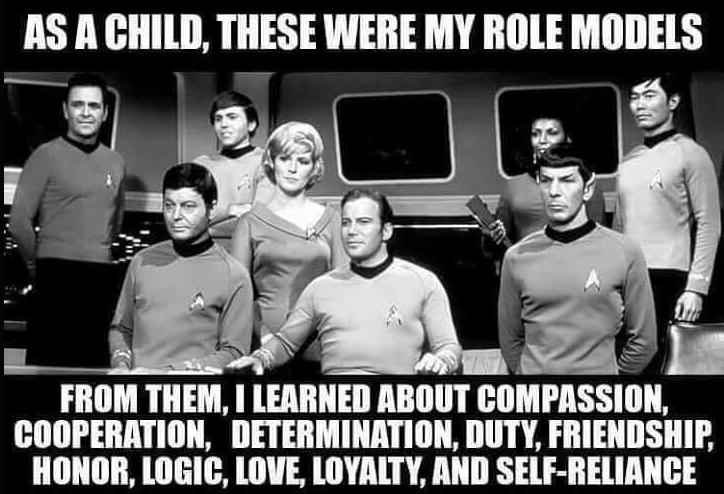 While I don’t think that there is a specific criteria defining a Super Fan, I can say what makes Star Trek unique to me is that the show presented me with role models. Please, try to name the characters on a television drama today that you would have children aspire to?!! It’s may be a tall order, but can you list your favorite characters or episodes? Captain Kirk is my favorite character, but all of the cast/characters from TOS are like family to me! Also, Mark Lenard’s portrayal of the Romulan Commander in “Balance of Terror” is my favorite protagonist. As a matter of fact, “Balance of Terror” has been my favorite episode of Trek for as long as I can remember. It borrows heavily from several World War II films, however even as a child I knew this story was about more that two spaceships locked in combat. I really do not care for the Discovery series on CBS All Access. It is not Star Trek. If you want a new Trek like series, watch “The Orville.” Or “Galaxy Quest” even! They ARE Star Trek! I really enjoyed the first JJ Abrams’s “Star Trek” film; it may actually be the best of all of the Trek movies. Not my favorite (I am too loyal to the crew’s from TOS and TNG! ), but maybe the best. The action was great, and the story didn’t require that you be a Trekkie or a Trekker to enjoy it. The long-distance communication between George and Winona Kirk in the beginning moments of the film still makes me cry! That scene made me say, “OK, this is Star Trek!” When I first saw it! I am truly honored to be interviewed by Laugh Trek! Please, everyone reading this, follow Laugh Trek if you haven’t already! LLAP!